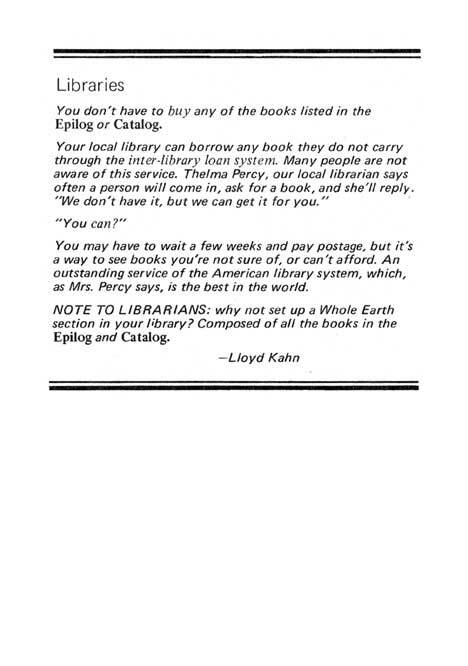 The Note to Librarians is a brief entry in The Whole Earth Epliog that I discovered towards the end of my research for a small exhibition at the MoMA Library in New York. The exhibition is essentially a collection of publications, the idea being to tell the story of counterculture bible The Whole Earth Catalog—its form, content, and publication history—through a specific set of books, a library. As such, the note was as concise a readymade curatorial statement as I could have hoped for.